The High Line, a disused, above-ground rail freight line converted into a park, which initially opened in June 2009, has in four years become New York City’s most visited park (yes, more than Central Park). Its roughly 4 million visitors as of 2012 is a couple of million below the Metropolitan Museum, one of the city’s top tourist sites. The High Line is also now surrounded by some of the city’s most innovative new buildings, designed by a slew of “starchitects.” How this happened (which I detail in a chapter in a forthcoming book on Manhattan’s Far West) is a story full of lessons of enormous interest. The High Line was originally built between 1930 and 1934 in order to raise street-level freight trains above Tenth Avenue, which had become the scene of so many traffic accidents that it was known as “death avenue.” It was part of Robert Moses’s West Side Improvement Project that eliminated 105 dangerous street-level rail crossings in Manhattan. It ran from 34th St down to a major shipping terminal just south of Canal Street. By the 1960s, the growth of trucking made the High Line, and many of the port facilities it served, obsolete. The Line’s southern section, below 12th Street, was demolished in the 1980s. For the next two decades the remainder’s fate was uncertain, its tracks overrun with wild vegetation. At the time of the movement to turn it into a park, it was owned by Conrail and Conrail shareholder CSX Corporation, who managed it. One lesson from the High Line is the difficulty of controlling and limiting history. For example, Mayor Bloomberg’s administration was by 2002 committed to preserving the High Line. But what exactly would the preserved High Line be? 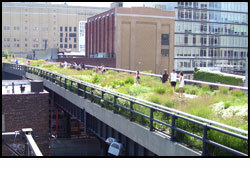 In 2003, New York historian Kenneth Jackson, expressing the view of many High Line supporters, backed the park project because it would enable people to recall vividly the city’s history, while preserving the wildlife that had grown up around the Line and was now seen as a metaphor for urban survival in tough times. In reality, the High Line conversion evolved in a different way, as an agreeable, elevated walk offering a series of different views at each section of the Line. Alongside the walkway were glorious new plantings, replacements for the “original” vegetation, that had survived the dark days of the High Line and city’s decline, but, it was quickly discovered, could not survive the High Line restoration. The striking views featured an eclectic variety: close-ups of new condo buildings by “starchitects;” old “historic” buildings, especially warehouses, although these are dwindling; views of the Hudson River to the west and of the city skyline to the east, including the Empire State building; and, after the High Line’s second section opened in June 2011, a view of the Javits Convention Center to which the third section of the High Line would link. The new “starchitect-designed” condos appeared alongside the historic rail line because the Bloomberg administration concluded, probably correctly, that in order to overcome opposition from a powerful group who owned the land under and adjoining the High Line (organized as the “Chelsea property owners”), it needed to rezone much of the area to allow major condominium developments, to which the Chelsea property owners could then sell their air rights. The West Chelsea Rezoning of 2005 was basically a deal allowing developers to initiate a frenzy of high-priced new condominiums alongside and near the High Line, giving it a monied aura. A second lesson of the High Line is that it began as a grassroots idea that the city then decided to support. It only succeeded because from the start, or almost the start, it was adopted by a pair of young visionary advocates, with the talent and persistence to shape the project and also work creatively with the political processes. The High Line’s cause was taken up by Chelsea/West Village residents, Josh David and Robert Hammond, who started the non-profit Friends of the High Line. In a David versus Goliath moment, they beat the Giuliani Administration’s attempt to demolish the High Line. They are examples of why urban planners stress the key role of “talented public and private entrepreneurs” if a public project is to succeed. A third lesson of the High Line concerns the role of nonprofits in American culture. In 2000 a young Frenchman, Frédéric Martel, who had begun a four-year term as France’s cultural attaché in Boston, decided to examine his country’s prevailing view that American culture was basically shaped by market forces, in contrast to French culture, which was heavily government funded and organized. After traveling widely through the United States, he concluded that the French view of American culture was misleading because it overlooked the key role of nonprofits in America. The role of the Friends of the High Line exemplifies Martel’s point. A final lesson of the High Line underlines the difficulty of (aka odds against) achieving mega projects. The High Line did not start as a mega project, but had evolved into a highly successful one by the time its second section opened in 2011, amid a series of other Far West mega projects that either never happened or took decades. Still, the High Line came within a hair’s breath of running afoul of the many reasons that typically doom mega projects in New York and elsewhere. For example, from 2005-08 the High Line received a crucial $73.8 million from the city, a huge chunk of the $86.2 million cost of completing stage 1.These were flush years for the city when its budget was in surplus. Had the High Line’s funding request and start been delayed by one year, as easily could have happened, it would have run into problems associated with the 2008 financial crisis and been stymied as the city’s budget fell into a deficit of $2.5 billion by 2009. For more information and to plan your visit to the High Line, see www.thehighline.org/.